Disney and romance. The two go together like Cinderella and Prince Charming, like Belle and her Beast, like Rapunzel and Eugene…you get the drill. With the amount of love stories from Disney that have captured our hearts time and again, Disney World has become a popular spot for date nights and proposals. After all, what could possibly be better than starting a new chapter of your life in the happiest place on earth, surrounded by all your favorite childhood characters? Nothing! For a date night away from the theme parks, head on over to the newly renovated outdoor shopping and dining area at the Walt Disney World Resort. Offering dining and shopping experiences and entertainment like no other, Disney Springs is the perfect place to experience cuisines from all over the world and indulge in a night full of music, dance and drinks. Disney Springs is also home to Splitsville Luxury Lanes, a 50,000 square feet extravaganza of bowling alleys, bars, pool tables, movie theatres and live performances. You may also hop on board the Aerophile—The World Leader in Balloon Flight and enjoy a bird’s eye view of everything the place has to offer. Stretch out on a blanket, cuddle up on a chair or snuggle up right on the grass under the starry sky and enjoy one of the free movies airing at the Disney resorts after sundown. Don’t worry if you do not have anything to lie down upon! Most resorts offer their own comfortable seating to guests, from beach chairs to warm blankets. 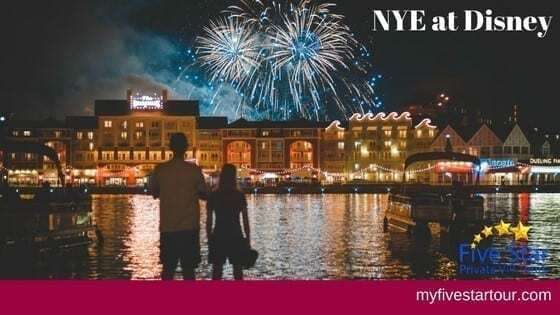 Anyone who has ever been to Disney World knows how crowded Magic Kingdom can get around the time of the fireworks with thousands of people clamoring for space—not the ideal place to enjoy the show in peace with your loved one. Some of the resorts scattered across the park, such as the Polynesian Village Resort on the Seven Seas Lagoon, Disney’s Boardwalk Inn and Beach Club Resort are all excellent places to get the perfectly secluded view of the show of lights from afar. Alternatively, you may also book a luxury cruise to view the Wishes Nighttime Spectacular or Epcot’s Illuminations. While a pricier option, this is also one of the best places to get down on one on! Take a ride aboard a horse drawn carriage like a true Disney couple at Disney’s Fort Wilderness Resort and Campgrounds or Disney’s Port Orleans Riverside Resort. This is the perfect time to enjoy some quiet time just basking in each other’s company after a long day of exploring the magic of Disney World. Make your vacation to Disney World with your significant other even more special by booking a private VIP tour with Five Star Private VIP Tours. With luxury transportation to and from the location, minimal wait times for all your favorite rides, and select seats at all the best shows, we are determined to make the memories of this experience last a lifetime.